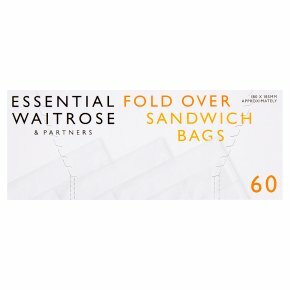 These single sandwich bags from the essential Waitrose range are perfect for light lunches. They measure around 18cm by 18.5cm and incorporate a pleat and a fold-over top to keep sandwiches fresh. The roll is made up of 60 individual bags, which are suitable for all foods. With a fold over closure top to keep sandwiches fresh. Suitable for all foods. Safety First:To avoid danger of suffocation keep this bag away from babies and small children. Do not use in conventional, microwave or combination ovens.. Not suitable for cooking food.. Not recommended for use in freezers.